The record for biggest prime number ever discovered has been shattered again. The latest holder of the title has 17,425,170 digits — over four million more than the previous "biggest" prime number, discovered in 2008, says a news release from the Great Internet Mersenne Prime Search (GIMPS), the distributed computing project that found it. Prime numbers are numbers greater than 1 that can't be divided by any numbers other than themselves or 1 to generate a whole number. The new prime number is a special, rare type of prime number called a Mersenne, which can be calculated by multiplying the number 2 by itself a particular number of times and then subtracting 1. It is named after the French monk Marin Mersenne who studied the numbers during the first half of the 17th century. 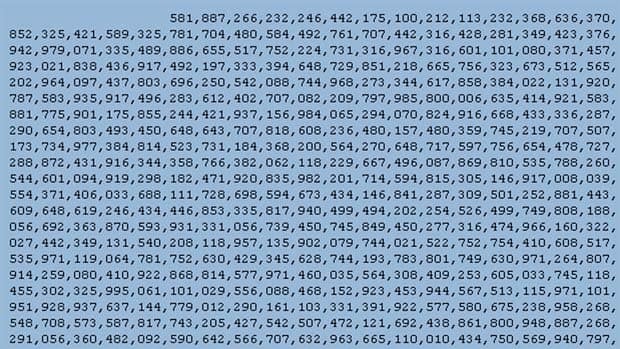 The new prime number, the 48th Mersenne prime ever discovered, is obtained by multiplying 2 by itself 57,885,161 times and then subtracting 1. It begins with 581,887,266,232… and continues for more than 17 million more digits. The 22.5-megabyte text file containing the full number of digits can be downloaded from the GIMPS website. The GIMPS project harnesses the power of computers volunteered by people around the world to check if certain numbers that could possibly be Mersenne prime numbers actually are. The newest record-setting prime number was discovered by the computer Curtis Cooper, a mathematician at the University of Central Missouri, on Jan. 25, after 39 days of non-stop computing to check if the number was indeed prime. Since it launched in 1996, GIMPS has discovered the 14 largest Mersenne prime numbers. One of them, the 39th Mersenne prime, was found by a volunteer in Canada in 2001. Canadians have also helped with the discovery of other prime numbers since then, including the previous biggest prime number, which was co-verified by doctoral student Jeff Gilchrist, who attends Carleton University in Ottawa.